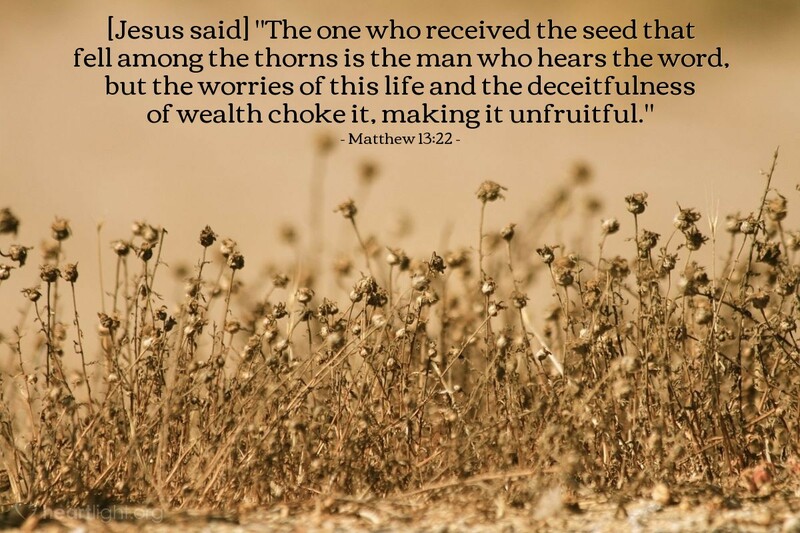 [Jesus said] "The one who received the seed that fell among the thorns is the man who hears the word, but the worries of this life and the deceitfulness of wealth choke it, making it unfruitful." All sorts of things can distract us from Kingdom matters. The wear and tear of everyday life can make it hard to keep our spiritual focus. But in an affluent society, our desire for riches, our pursuit of material things, and our selfishness with wealth can entangle us in worry. Worry can stifle our faith. Eventually the fruitfulness of the Gospel is choked out and we lose our spiritual vitality. Our greatest riches are found in Jesus. If he is our priceless treasure and the Kingdom is our highest priority, then we can handle the other things that come our way. Gracious Father, please help me to faithfully use the blessings you have lavishly poured out upon me. Please don't let me be deceived or owned by the things I possess, nor do I want to covet what I do not have. Give me an undivided heart about the matters of your Kingdom. Please bring to life in me the fruitfulness of a heart full of your grace. In Jesus' name I pray. Amen.